May beetles, commonly referred to as June bugs and June beetles, are known for their large numbers in late spring and early summer. The insects can be various colors but are most often reddish-brown or green. May beetles are considered invasive pests because of their tendency to destroy lawns, plants and vegetation. Deciphering male May beetles from females can be difficult, but several ways to distinguish the two genders exist. Both male and female May beetles have the capability to fly, but their preferences for ideal flight times vary. Male species generally fly from mid- to late morning, while female May beetles typically fly in the early morning. Males are known to fly in large clusters and have the tendency to wander. Females usually hover over their territories' surface and are less likely to explore. Peak flights for May beetles occur in mid- to late June. May beetles who are near eggs or are found deep within soil are most likely females. Mother May beetles dig between 2 and 5 inches into the soil to deposit their eggs. They generally lay 10 to 30 eggs, but some species deposit close to 40. Females typically prefer to lay their eggs in the moist organic soil around trees and plant life. The eggs come out almost round and about 1/16 inch in size. The eggs absorb moisture from the ground and generally hatch in about two weeks. Many insects are attracted to lights, and May beetles are no exception. But the gender of those pesky beetles covering light bulbs and fixtures is probably male. Female May beetles are generally less attracted to light, primarily focusing on food, mating and laying eggs. 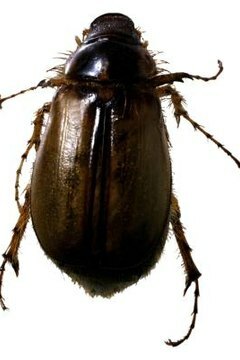 Male May beetles are more curious about lights and are prone to fly toward porch bulbs or window light if trapped inside. The insects most often fly toward bright lights during the night hours. During the summer months, people often notice a peak in May beetles on lawns, in trees and in the air. It's May beetle mating season, and the insects are frequently seen in pairs reproducing. To find a mate, females produce an odor that attracts males. Because of this, you may see a male May beetle flying toward a solitary female beetle on a leaf or other surface. During mating, the male May beetle typically is near the back of the female. A short time later, female May beetles head toward the soil to lay eggs, while males tend to fly or feed.